Mette Vangso is a Danish design maven based in San Francisco. She's created a decadent line of luxurious, eco friendly, organic, natural spa products - all inspired by modern art, fashion, nature, and comfort. Her collection introduces hot and cold therapy for the body, mind, and soul. Mette selects a limited edition of fabulously artistic fabrics each year for her line of aromatherapy pillows. She fashions them with high quality ingredients, including organic buckwheat and flaxseed and natural ingredients including lavender, chamomile, and other herbs and flowers that support natural healing. The pillows bring soothing hot or cold relief to aching muscles and tired eyes, while providing aromatherapeutic calm to the senses. Available in three models, The Classic, The Neck Hugger, and The Eye Catcher, Pleasure Pillows can be heated in the microwave for soothing muscle pain relief, or chilled in the freezer to reduce inflammation. Heated or cooled, these luxurious pillows will restore vital energy, and can reduce stress, cramps and muscle tension, while promoting a balanced state of mind. Mette is the kind of female entrepreneur we delight in at Mignonne. Mette departed a successful corporate career to follow her dream of eco-entrepreneurship and founded her own design studio in the bay area. 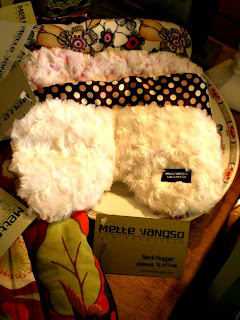 Mette's spa pillows have been featured in PEOPLE and GLAMOUR magazines. 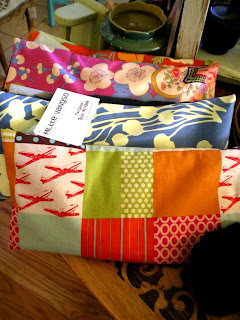 Mette says her pillows are a labor of love that allow her to satiate her desire to create beautiful things, while producing products that make people feel good on many levels--combining luxury, comfort and healing in one package. Check out the Monday Weekly Peek! Introducing ... Friday's Fabulous French Find! Mignonne Celebrates Bastille Day All Week Long! We have gorgeous new jewelry at Mignonne! Be My, Be My Little Baby!